With the completion of these projects, all flood recovery efforts will be completed this year except for those involving the three closed campuses – Denham Springs Elementary, Southside Elementary and Southside Junior High. Negotiations are still ongoing with FEMA and the Governor’s Office of Homeland Security and Emergency Preparedness (GOSHEP), and to date, no work plan has been approved for any of the campuses. All three schools will continue to operate at their temporary locations for the 2018-2019 school year. 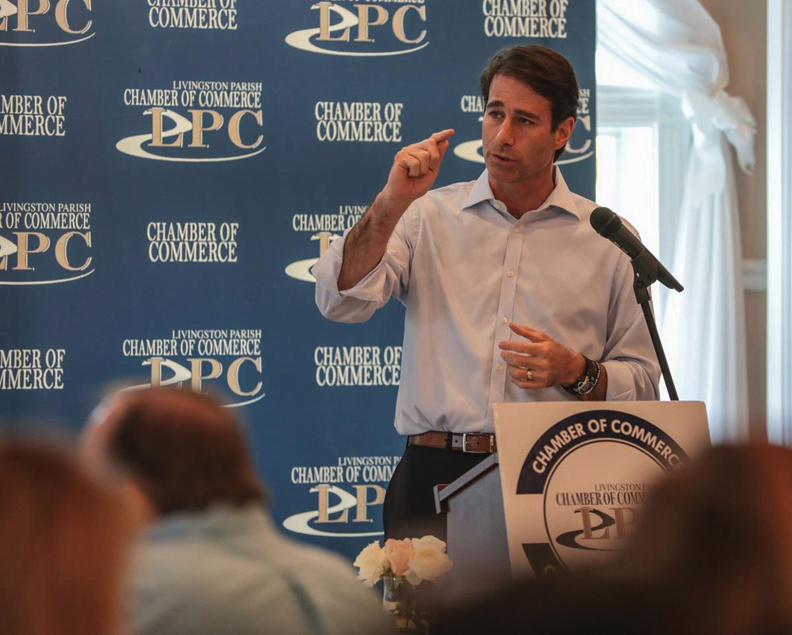 Congressman Garret Graves recently spoke to the Livingston Parish Chamber of Commerce about his efforts to bring much-need flood recovery aid to Livingston Parish. Photo courtesy of Livingston Parish News. Louisiana Congressman Garret Graves recently announced that he and members of the Louisiana Delegation in the U.S. House of Representatives added an amendment to the federal budget to provide $20 million in federal aid to Livingston Parish Public Schools. The proposed amendment, however, still awaits approval by the U.S. Senate. At the same time, Graves has proposed that FEMA waive insurance guidelines that could severely hamper the school district’s recovery efforts. 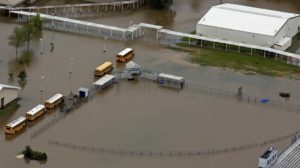 Currently, FEMA requires a $500,000 deductible per building be paid as a penalty for the school district not having flood insurance. Graves is proposing the penalty be reduced to $500,000 per campus – not per building – to save the district millions of dollars. Graves said a similar waiver was granted to schools in the New Orleans area following Hurricane Katrina. 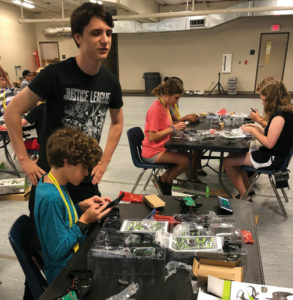 Jacob Wilkinson, a senior at Walker High School, helps to instruct Evan Blazier from Denham Springs Junior High on how to assemble a drone, while a group a middle school girls work in the background. The students attended the beginner’s drone summer camp at Walker High School. Students in Livingston Parish recently took part in summer camps at Walker High School to learn how to navigate the skies with unmanned aircraft systems (UAS), or drones, as well as learn the basic safety guidelines and applications of the new technology. Instructor Steve Johnson offered two three-day sessions: a beginner’s camp for students in grades 4-8, and an advanced camp for older students. “This class introduced our students to the many facets of drones, robotics and the future of the drone industry,” Johnson said. He said students learned how to operate drones safely and ethically by gaining an understanding of the technology itself, as well as some of the laws and regulations surrounding drones. They also learned about business and commercial applications of the technology. 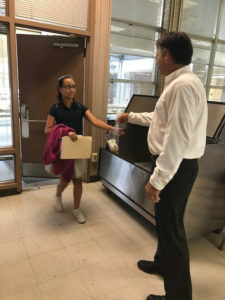 Westside Junior High School Assistant Principal Brian Gunter hands a pre-packaged breakfast to South Walker Elementary student Bailee Chiro before the start of summer classes at his campus. Livingston Parish Public Schools anticipates serving nearly 15,000 free meals this summer to students enrolled in academic programs across the parish. Assistant Supervisor of Child Nutrition Programs Sommer Purvis said the district is providing pre-packaged breakfast and lunch meals to all campuses where summer courses are being taught, including Juban Parc Elementary, Northside Elementary, South Live Oak Elementary, Westside Junior High, North Corbin Junior High, Springfield Middle School, Doyle High School, Denham Springs High School and Live Oak High School. Livingston Parish Public Schools ranks No. 2 in Louisiana for the number of high school graduates who earned a diploma with added credentials, according to the Louisiana Department of Education’s recent report on graduation rates. Nearly 74 percent of all high school graduates in Livingston Parish earned an Advanced or Basic credentialed diploma, according to the report. 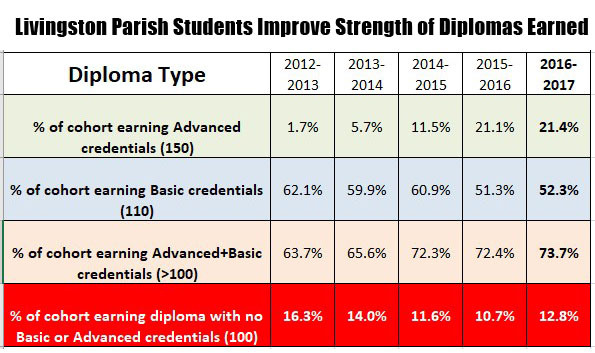 The most recent data for the 2016-2017 school year shows that Livingston Parish students have steadily increased the strength of diplomas earned over time. According to the latest report, 21.4 percent earned diplomas with Advanced credentials and 52.3 percent earned diplomas with Basic credentials. Those with Advanced credentials are up considerably from the 1.7 percent who earned them in 2012-2013. Livingston Parish also ranked No. 2 for the fewest number of graduates earning a standard diploma. Only 12.8 percent earned a standard diploma with no additional credentials in 2016-2017. McRae noted that Livingston Parish also recorded its highest graduation rate to date in 2016-2017. The report showed 86.6 percent of Livingston Parish’s high school students graduated in the allotted four-year time – that’s up 3.4 percent from the previous year, which saw 83.2 percent graduate on time; and up 7 percent from the 2013-2014 school year, when 79.6 percent graduated on time. 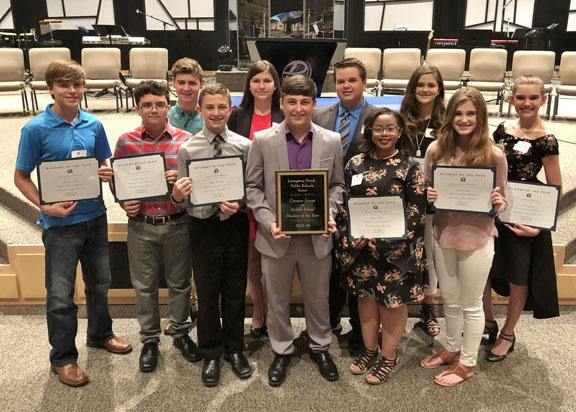 Livingston Parish Public Schools recently recognized the district’s top Students of the Year winners in grades 5, 8 and 12, as well as those students from each of the parish’s schools. The parish’s 2018 Student of the Year winners are Emily Maranto, a senior at Live Oak High School; Carson Jones, an 8th grader at Live Oak Junior High; and Jace Griffin, a 5th grader at Live Oak Middle School. All three winners competed in the state’s regional competition. 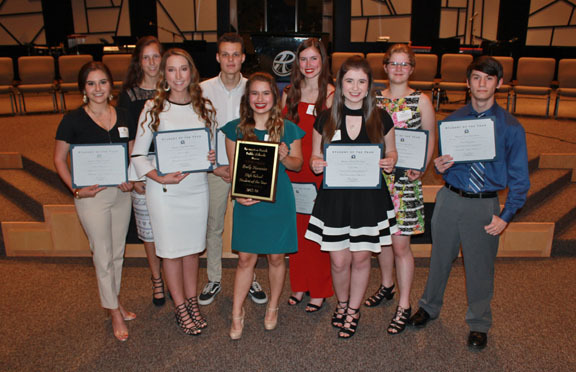 Pictured are the Livingston Parish 2018 High School Student of the Year winners, from left to right, (front row) Hannah Gautreau, Maurepas; Marian Luzier, Walker; Emily Maranto, Live Oak; Emily Otken, Denham Springs; Caleb Charpentier, Doyle; (back row) Haley Williams, Holden; Brennan Hagan, Albany; Alana Chandler, Springfield; and Rose Emery, French Settlement. 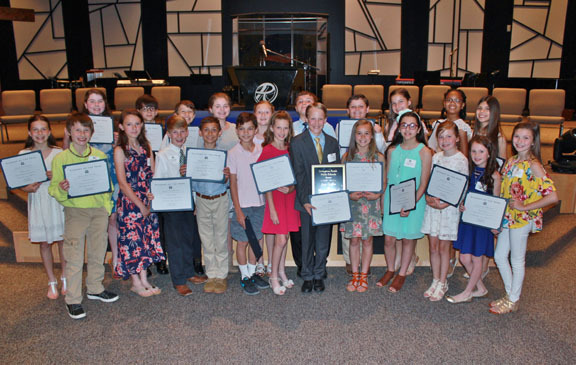 Pictured are the Livingston Parish 2018 Middle School Student the Year winners, from left to right, (front row) Braden McLin, Doyle; Matthew Larpenter, Springfield Middle; Lynn Cole Slaby, Denham Springs Junior High; Carson Jones, Live Oak Middle; Lauryn Shavers, Juban Parc Junior High; Brianna Daigle, Southside Junior High; Sara Waguespack, Westside Junior High; (back row) Karson Thacker, Maurepas; Madison Brignac, French Settlement; Joel Penalber, Holden; and Ilea Watson, North Corbin Junior High. Not pictured are Abrielle Ochsner, Albany Middle; and Hunter “Champ” Morales, Frost. Pictured are the Livingston Parish 2018 Elementary Student of the Year winners, from left to right, (front row) Makayla Jarrell, Juban Parc Elementary; Zachary Jennings, Frost; Julianna Easley, South Fork Elementary; Landon Watts, Albany Middle; River Barnet, Walker Elementary; Brody Cloyd, Eastside Elementary; Adryanna Arledge, North Corbin Elementary; Jace Griffin, Live Oak Middle; Sadie Gallman, Levi Milton Elementary; Vivian Pierce, Denham Springs Elementary; Hannah Hamilton, Lewis Vincent Elementary; Sydney Kinchen, Springfield Middle; Gabrielle Harris, Southside Elementary; (back row) MacKenzie Hutson, Maurepas; Rhett Pitarro, South Walker Elementary; Sawyer Herring, Holden; Cecilia McMaster, Northside Elementary; Anna Gelpi, Freshwater Elementary; John Geiger, French Settlement Elementary; Easton Benesta, Doyle Elementary; Kellie Laporte, Gray’s Creek Elementary; Chelsea Bellony Ho A Sim, Seventh Ward Elementary; and Berenice Chavez, Eastside Elementary. Livingston Parish Public Schools recognized the district’s top principals and teachers for the 2017-2018 school year, as well as the Teacher of the Year nominees from each school in the parish. Pictured are the 2019 Livingston Parish Teacher of the Year winners, from left to right: High School Teacher of the Year Jessica Bonura, Live Oak High School; Middle School Teacher of the Year Kimberly LeJeune, Live Oak Middle School; and Elementary Teacher of the Year Dane’ Long, Live Oak Elementary School. 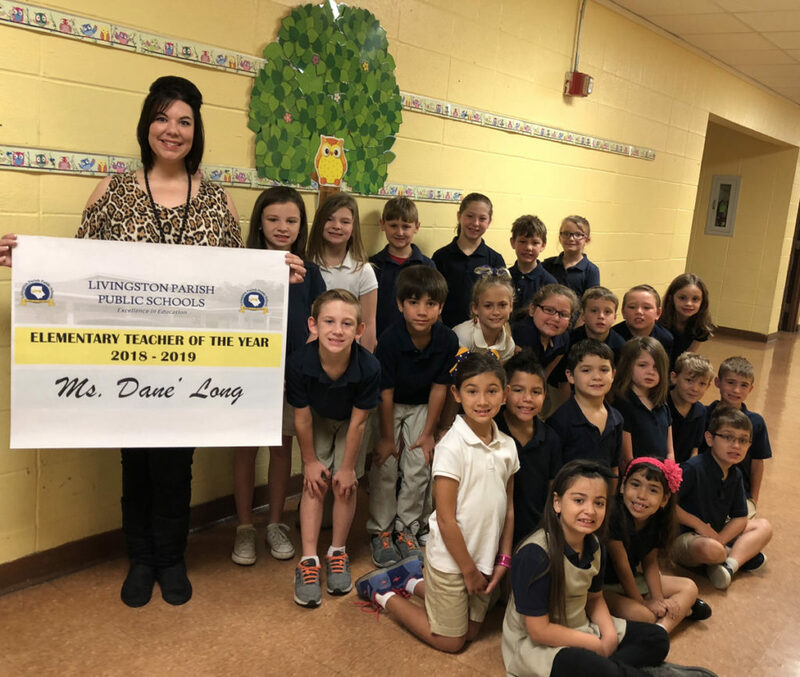 Long is also a semi-finalist for the 2019 State Teacher of the Year, which will be announced at a special ceremony in Baton Rouge on July 27. 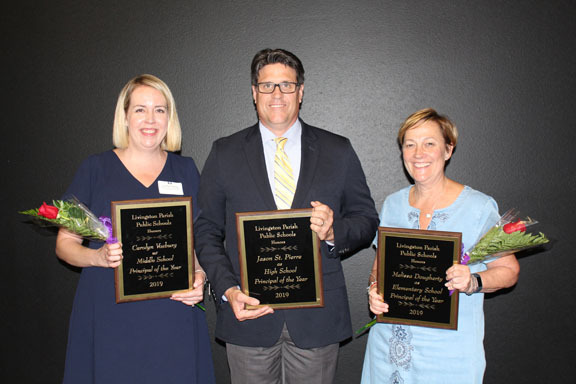 Pictured are the 2019 Livingston Parish Principal of the Year winners, from left to right: Middle School Principal of the Year Carolyn Vosburg, North Corbin Junior High School; High School Principal of the Year Jason St. Pierre, Walker High School; and Elementary Teacher of the Year Melissa Dougherty, Gray’s Creek Elementary. LPPS Elementary Teacher of the Year nominees: Gabby Mire, Albany Lower Elementary; Karen Faust, Albany Upper Elementary; Kris Kleinpeter, Denham Springs Elementary; Taffy Sexton, Doyle Elementary; Judy Carr, Eastside Elementary; Jessica Boudreaux, French Settlement Elementary; Jeanette Milne, Freshwater Elementary; Amanda Naquin, Frost; Dana Fontenot, Gray’s Creek Elementary; Haley Mercante, Holden; Kelli Lowery, Juban Parc Elementary; Shay McDaniel, Levi Milton Elementary; Tara Schwartz, Lewis Vincent Elementary; Dane’ Long, Live Oak Elementary; Kristi Lemoine, North Corbin Elementary; Allison Richardson, North Live Oak Elementary; Kelly Chevalier, Northside Elementary; Kayla Wales, Seventh Ward Elementary; Laurie Petty, South Fork Elementary; Meghan Flores, South Live Oak Elementary; Leah Richard, South Walker Elementary; Donna DePaula, Springfield Elementary; Tamie McCaffery, Southside Elementary; Carissa Peters, Walker Elementary. LPPS Middle School Teacher of the Year nominees: Irene Farace, Albany Middle; Amanda Brian, Denham Springs Junior High; Natasha McMorris, French Settlement High School; Krystal Hughes, Holden High; Mary Loofbourrow, Juban Parc Junior High; Pamela Myers, Live Oak Junior; Kimberly LeJeune, Live Oak Middle; Barbara McCaskill, North Corbin Junior High; Lisa Deer, Southside Junior High; Kim Kinchen, Springfield Middle; Lauri Rentz, Westside Junior High. LPPS High School Teachers of the Year nominees: Shellie Woodward, Albany High; Sarah Halphen, Denham Springs High; Jill Johnson, Denham Springs Freshman High; Casey Moskau, Doyle High; Mindy Bailey, Holden High; Jessica Bonura, Live Oak High; Ann Mullis, Maurepas High; Aimee Freeman, Springfield High; Karen Davenport, Walker Freshman High; Brooke Rhymes, Walker High. 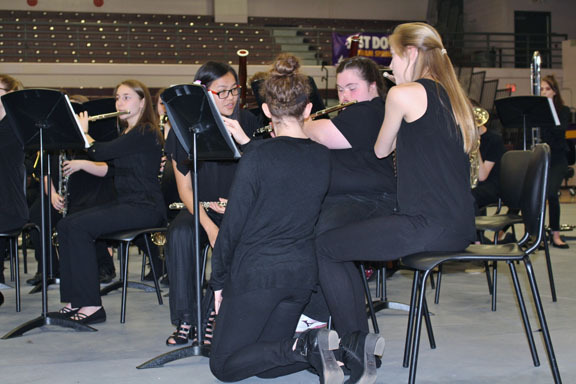 The Denham Springs High School Band participated in the state’s first United Sound® performance during its May 8 spring Wind Ensemble concert, featuring the musical talent of four local students with special needs. United Sound® is a school-based instrumental music club for individuals with intellectual or developmental disabilities and their typical peers. Band Director Andrew Hunter learned about the program in December at conference in Chicago, and returned to the campus with a passion to begin a local chapter. “We are so proud that Denham Springs High School is the first in Louisiana to create an inclusive musical learning environment through this program,” Hunter said. Making their debut performance with the high school band were Kassi Rice on the flute, Brandon Smith on the euphonium, Christel Dugas on the trumpet, and Alexis Archer on the marimba. They were assisted in the performance of “Procession of Heroes” by their peer mentors. The students began their instruction in February, meeting once a week with instructors and the peer mentors to learn how to take instruments out of their cases, make their first sounds, play notes while reading music and playing the piece they performed at the concert. New musician Kassi Rice plays the flute with the Denham Springs High School Wind Ensemble. She was assisted by her peer mentors Courtlyn McFearin (left), Shelby Taylor (kneeling) and Laurel Junda (right). Also pictured far left is band member Savannah Cecchini. 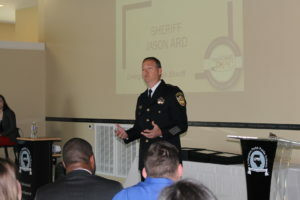 Livingston Parish Sheriff Jason Ard recently spoke to the Livingston Parish Chamber of Commerce about his concerns on how to best handle school safety. At the request of school officials, Livingston Parish Sheriff Jason Ard says he is considering asking voters to approve a new half-cent sales tax on the Nov. 6, 2018 ballot to fund the placement of school resource officers at each of the district’s 46 campuses. The school system currently has seven resource officers who are responsible for all campuses parishwide. One officer each from the Denham Springs and Walker police departments serves the schools within city limits, while the other five are sheriff’s deputies assigned to geographic zones across the parish. The school district pays about half the cost of the officers through agreements with the law enforcement agencies. Ard says the parish would need at least 50 SROs to meet the current demand, and he estimates the cost for each SRO to be approximately $111,000 annually, which includes wages, benefits, equipment and a mobile unit. Current sales tax estimates suggest a half-cent sales tax could raise between $8 million and $10 million. Pictured, left to right, are 2017 National Winner Gabriel Garland, Albany Middle School; 2018 State Winner James Weedman, Albany Middle School; Teacher Christina McKay; 2018 State Winner Solomon Toney, Albany Middle School; Teacher Karen Pourciau, 2018 State Winner Colin Schultz, Live Oak High School; and Speech Therapist Allison Richardson. Not pictured are 2017 National Winner Zachary Yang, Southside Elementary; and 2017 State Winner Isaiah Johnson, Freshwater Elementary. Livingston Parish Public School administrators, board members and faculty recently recognized the parish’s top winners in the “Yes I Can” competition at the state and national levels for 2017 and 2018. 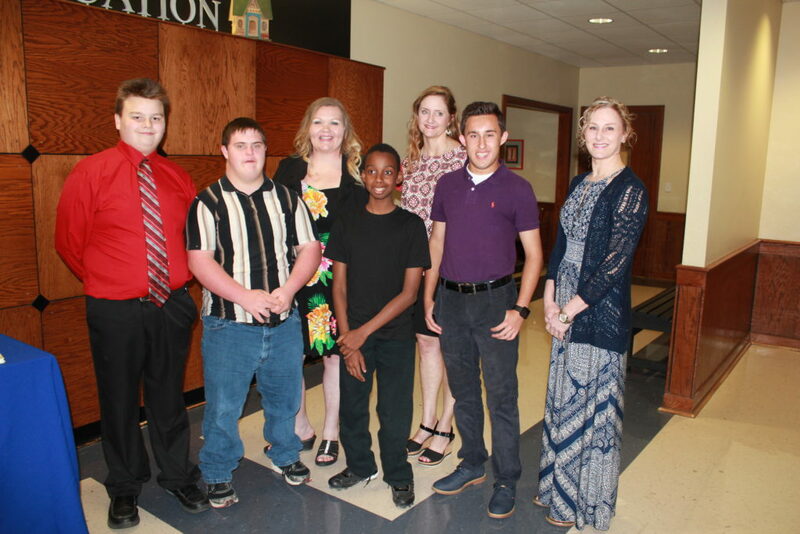 The “Yes I Can” awards program, which is sponsored by the Council for Exceptional Children (CEC), recently recognized Livingston Parish students with exceptionalities for their outstanding achievements. The program recognizes accomplishments in six categories: academics, arts, school and community activities, self-advocacy, technology and transition; as well as those education professionals who work with the children and youth. 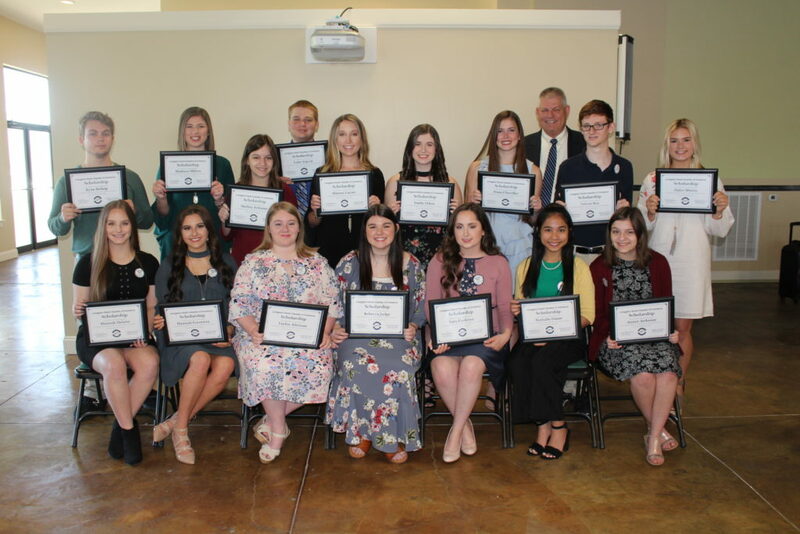 The Livingston Parish Chamber of Commerce recently awarded scholarships to 17 parish seniors during its annual State of Education meeting. Each scholarship, valued at $500, is made possible through contributions from member businesses. Winners of this year’s scholarships included: pictured left to right, (standing) Ryan Bishop, Madison Milton, Shelly Ardonne, Luke Seguin, Marian Luzier, Emily Otken, Alana Chandler, Superintendent Rick Wentzel, Trevor Ray, Halee Morris, (seated) Hannah Delatte, Hannah Gautreau, Taylor Alleman, Rebecca Judge, Sara Hazleton, Nathalie Danie, and Aimee Ardonne. 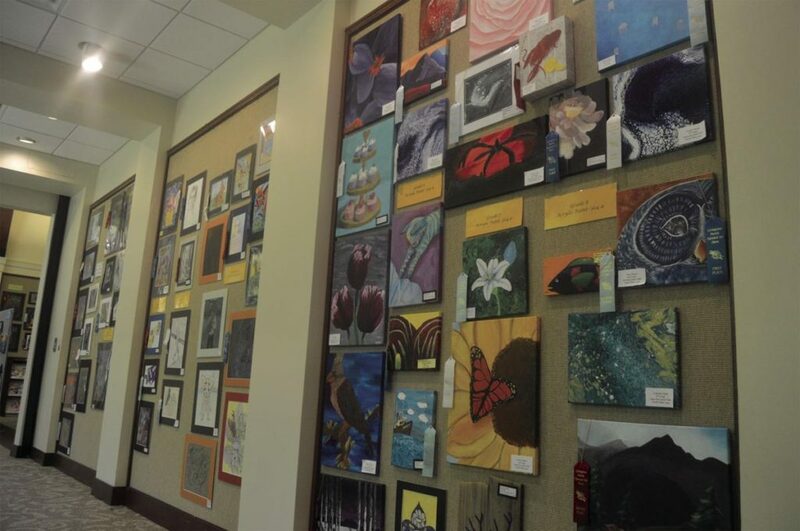 For the remainder of the month of April, the Livingston Parish Library’s Albany-Springfield Branch will showcase the 15th Annual Talented Visual Art Show featuring artwork from K-12 gifted and talented art students from across the parish. The library is located at 26941 La. Hwy. 43 in Albany. Photo courtesy of the Livingston Parish News. Pictured from right to left are: (top row) Teacher Sara Young, Rylla Gautreau, Carmelo Morris, Justice Deer, Jackson Poe, Abby Washburn, Autumn Stafford, Maddox Thompson, Teacher Melanie Hickman; (middle row) Morgan Scott, Charlie Jo Walters, Lailah Sylve, Myles White, Garrett Inman, Cohen Johnson, Hayden Wilson, Collin Christian; (bottom row) BraLynn White and Chloe LaCost. 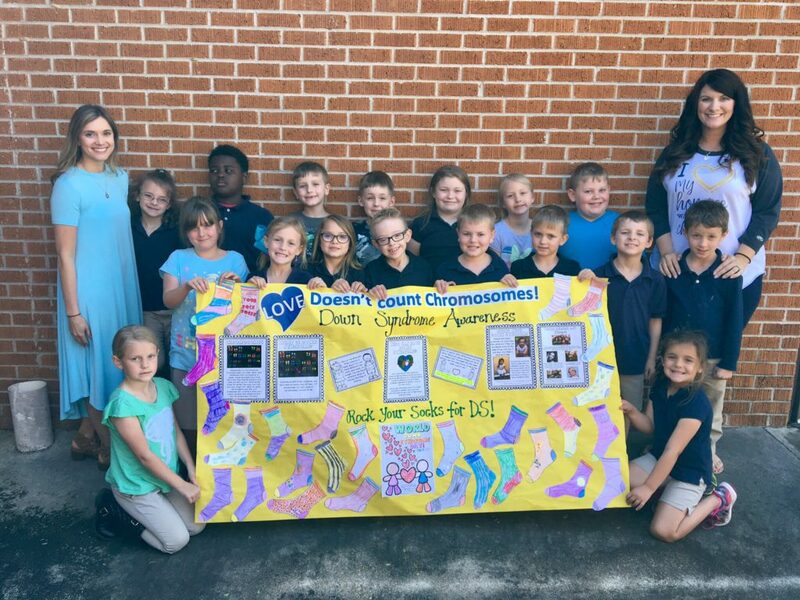 First graders at Doyle Elementary recently celebrated World Down Syndrome Day with a special lesson that illustrated how children with Down syndrome are more alike other children than they might appear. The most interesting moment of the lesson came when the teacher asked the students if they knew someone with Down syndrome and they all answered “no.” That’s because one of their classmates, Myles White, is a child with Down syndrome. The lesson included a story about a Down syndrome boy and emphasized how children with Down syndrome can accomplish many of the same things as other children, but maybe with a little help and support to get it done. At the end of class, the students participated in a demonstration that allowed the students to experience what it might be like for a Down syndrome student learning to write and talk. The students put socks on their writing hands and tried to write a sentence, and then they stuffed marshmallows in their mouth and tried to talk. 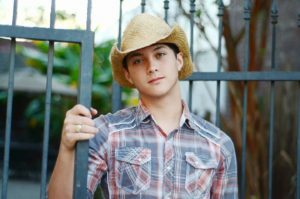 Laine Hardy, a 17-year-old senior at French Settlement High School, made his debut appearance on the ABC Network’s American Idol on Monday, March 12, with an audition that won the approval of this year’s celebrity judges – country music superstar Luke Bryan, music icon Lionel Richey and pop star Katy Perry. Hardy’s solo audition on the show marked the first time he ever performed on his own. He said he started singing a couple of years ago with his brother and cousin, and the trio had only performed in a few local restaurants before Hardy got his break. Hardy’s gritty country voice is prominently featured by the show. His performances are posted on YouTube and his Facebook page. French Settlement Senior Brayden Aime has done what most students can only imagine. He scored the maximum score of 36 on the ACT. The ACT is one of the nation’s top college entrance exams, and the predominant exam given to college-bound students in Louisiana. It includes four mandatory sections – English, math, science and reading – and an optional writing section. Out of the 1.8 million students who take the test every year, only about 1,000 get the highest possible ACT score. Aime said he earned the 36 on his second attempt. “I felt relieved when I got my score. I knew my family would want me to take again if I hadn’t done that,” he said. Aime said he plans to attend the Massachusetts Institute of Technology (MIT) or Yale University in the fall to pursue a double degree in Computer Science and Mathematics, with a minor in International Relations. Aime has a scholarship to study in in Rome, Italy this summer, and he has lined up a paid internship in Washington D.C. for next summer. Eastside Elementary Assistant Principal Lauren Kennedy (right) receives the Top 5 finalist award for the National Life Group’s 2017-2018 Life Changer of the Year Award, from Sean Davis (right), who nominated her for the award. Kennedy will travel in May to Bermuda, where the top winner will be announced. 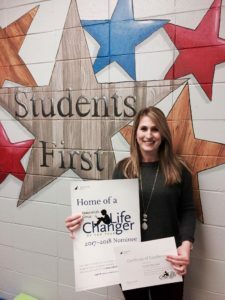 Eastside Elementary Assistant Principal Lauren Kennedy has been named a grand-prize finalist for the National Life Group’s 2017-2018 Life Changer of the Year award. Kennedy received word of her Top 5 status at a surprise presentation at her school on March 5. Lured to the school’s gym under the false pretense of a “maintenance issue,” Kennedy opened the gym door to a resounding “Surprise!” from nearly 600 students, teachers, school administrators and family members. Kennedy was nominated for the prestigious award by a former high school classmate who knew about her efforts to help others after the August 2016 flood. Kennedy and four other national finalists will be flown to Bermuda in mid-May to attend the awards ceremony, where the top winner will be announced. The winner will receive $10,000, with half of that going to the winner’s school. For being named a grand-prize finalist, Kennedy has already be awarded at least $5,000 to be split between her and Eastside Elementary. Cafeteria Workers at French Settlement High School were honored during a special pep rally that celebrated the school’s increase in breakfast participation. NFL Saints Player Trey Edmunds visited the school and spoke to the students about the importance of a healthy diet and good nutrition. Pictured with Edmunds are, standing left to right, Livingston Parish Child Nutrition Director Leah Smith, cafeteria workers Georgia McCon, Melissa Dark, Kimberly Villneurve, Trudy Culler, Katherine Bedney, Jay Levy, Child Nutrition Assistant Director Sommer Purvis, and (kneeling) cafeteria worker Marleen Cutway. Louisiana’s First Lady Donna Edwards visited North Corbin Junior High on March 7 to announce the top performers in the state’s “No Kid Hungry” Breakfast Challenge. Pictured with First Lady Donna Edwards (left) is North Corbin Junior High Principal Carolyn Vosburg. French Settlement High School and North Corbin Junior High recently received the state’s highest awards in the “No Kid Hungry” Breakfast Challenge, which is sponsored by the Louisiana Department of Education and Gov. John Bel Edwards. French Settlement High had the largest increase in breakfast participation among schools with grades 9-12, while North Corbin Junior High topped the list among schools in the K-8 category. Participation in school breakfast is up 46 percent this year across the parish. The school system has been able to offer the food for free through the Community Eligibility Program (CEP) – Livingston Parish qualified due to the large number of families impacted by the devastating 2016 flood. At the same time, the district has made the meals more appealing, by feeding students in their classrooms with a bagged breakfast and offering them a mid-morning break. 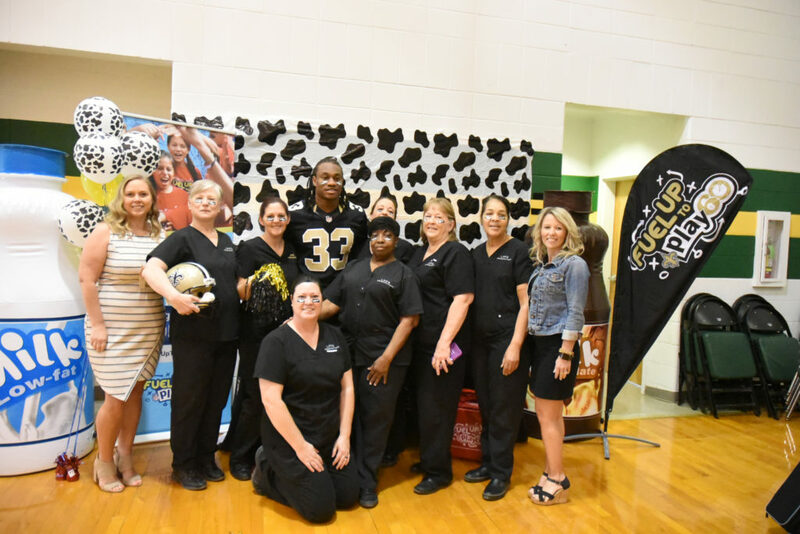 The two winning schools celebrate their increase with pep rallies that featured representatives from the New Orleans Saints football team. Springfield High Sophomore Brielle Lee tries on the wardrobe costume, assisted by fellow theatre students Hamilton Haverkamp, Noah Bonura and Mason Sibley. 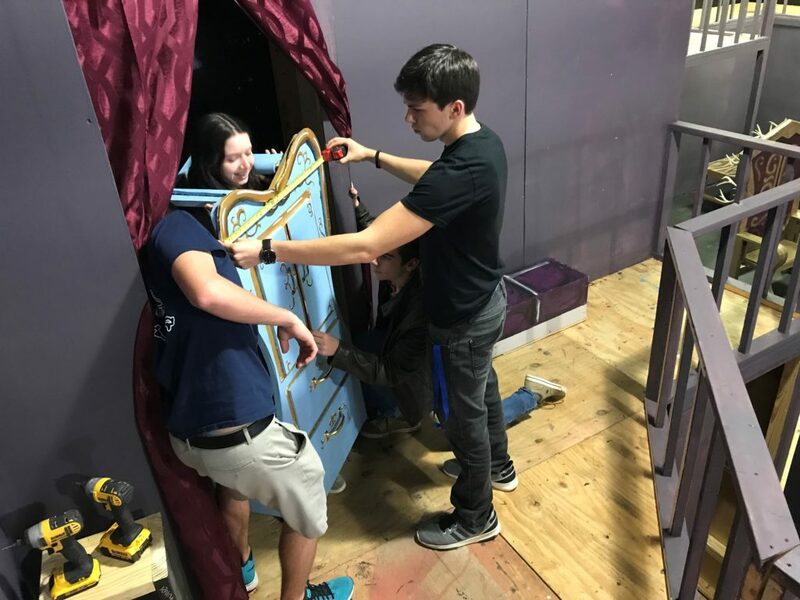 This and numerous costumes for the Beauty & the Beast production were built by Mason Sibley, Lane Degenhardt, Hamilton Haverkamp, Noah Bonura and Ronnie Wells. The Springfield High School Theatre students will perform a live, on-stage production of Walt Disney’s “Beauty & the Beast” April 9-14 at the school. Daily performances will be held at 9 a.m., noon and 7 p.m., April 9-13. Ticket prices for each session are $5 per person, except admission for the 7 p.m. show on April 11 will be free and will include an inspirational message delivered by Wind Ministries Pastor Terry Lobell. The students will also present a dinner theater performance on April 14 at 7 p.m., which will feature a full-course meal prepared and served by Johnny Ziegler, owner of Pop’s Blazin’ Smokers. Tickets for that one-night-only event are $25 per person. The production is based on a French fairy tale about a prince who is magically transformed into a Beast and his servants into household objects as punishment for his arrogance. The Beast imprisons Belle, a beautiful young maiden, in his castle in hopes of breaking the spell. To become a prince again, the Beast must learn to love Belle and earn her love in return before the last petal from an enchanted rose falls, or else the Beast will remain a monster forever. Eastside Elementary Assistant Principal Lauren Kennedy is a nominee for the 2017-2018 Life Changer of the Year Award for the positive impact she has made in the lives of her faculty, staff, and students. Life Changer of the Year is a prestigious awards program that recognizes K-12 educators and school employees across the nation who make a significant difference in the lives of others by exemplifying excellence, positive influence and leadership. The winner and top finalists receive a generous cash award for themselves and their school districts. Kennedy is credited with organizing flood relief efforts for her school’s community following the August 2016 flood. Like most people in the area, Kennedy wanted to do what she could to help. But what made Kennedy standout was her experience dealing with flood recovery, her leadership skills to organize and motivate people to do important tasks, and her loving heart and fierce faith-based determination to bring hope to those around her. “Lauren will tell you that she feels like she’s not done anything special to receive this nomination, but the difference between Lauren and others is that she displays her kindness and helpfulness everyday! She thinks nothing of it, because it’s just a part of who she is,” Eastside Elementary Principal Kelly LaBauve said. Kennedy is competing against more than 850 people from all 50 states and the District of Columbia. The finalists and overall winner are expected to be announced in March. Students at Walker High School listen to a video presentation from money management expert Dave Ramsey during a class lesson in the Foundations in Personal Finance class. Students at Walker High School are getting important lessons in how to better manage money, thanks to a popular new course elective on the campus that’s being taught by one of the world’s most renowned personal finance experts. The course, Foundations in Personal Finance, is the creation of financial consultant Dave Ramsey, who developed an easy to use, turnkey school curriculum that teaches students the value of saving, spending and giving them guidance down the path of financial literacy. Ramsey delivers the course lectures, which are designed for high school students, through a series of videos, printed lessons and activities. The course meets the standards and benchmarks in Louisiana as an accredited course. “Knowing how to manage money is a lifelong skill that every person should know. We believe that having a healthy understanding of money better prepares our students to make smart financial decisions in life,” said Walker High School Principal Jason St. Pierre. St. Pierre said the Foundations in Personal Finance elective was made possible through a donation from local members of the Livingston Parish Chamber of Commerce. Frost Elementary is serving as a testing ground for a bus tracking application that allows parents to follow their child’s ride. Transportation Director Jeff Frizell said GPS trackers have been installed on four buses that serve the K-8 school. For the next month, the trackers will show parents and district administrators where the buses are in real time. By knowing if the bus is running late or quickly approaching their child’s pick-up stop, parents can better adjust their schedules to meet the bus. At the same time, the application can help to track if a driver is speeding or making harsh turns. parishwide. The cost to implement the technology parishwide would be $118,000 per year. The technology is already in use in East Baton Rouge and Tangipahoa parishes. Doyle High School Freshman Christopher Merrell, left, receives a snack packet from Livingston Parish Public Schools’ Child Nutrition Assistant Director Sommer Purvis at the parish library in Livingston. Merrell said he learned about the Feeding Young Minds program from a classmate last fall and started coming in late September. Since then, he, his brother and several friends participate in the program every Wednesday after school. Livingston Parish School System is partnering with the Livingston Parish Library System and Mighty Moms, a local volunteer organization, to support the after-school program, Feeding Young Minds. The program provides students with a free snack and drink and a safe haven to get homework done or take part in educational programs. Purvis said the program utilizes all five libraries in the parish and serves as many as 100 students each week. Assistant principals, counselors and librarians across the parish help to staff sessions at the library closest to their schools. Megan Mincey, right, is pictured with the LSU Agriculture Center’s Associate Vice President Dr. Phil Elzer, as she is awarded the 2018 Senior Showmanship Champion Award at this month’s State Livestock Show at the Lamar Dixon Expo Center in Gonzales. 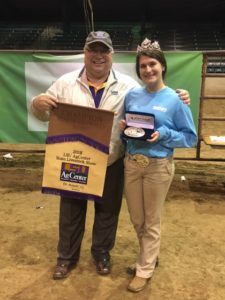 Denham Springs High School Senior Megan Mincey recently won the Overall Senior Showmanship Champion Award and top awards in the Dairy and Beef categories of the 2018 LSU AgCenter State Livestock Show, which was held earlier this month at the Lamar Dixon Expo Center in Gonzales. Mincey’s Jersey cow outscored all other dairy cows, earning her the Supreme Champion Dairy Female. Her beef cow also bested all others in the All Other Breeds Class in the Beef Division to earn Reserve Grand Champion AOB. Other awards included first place in showmanship in Dairy and two first place awards in the Jersey Class. Mincey is president of the Future Farmers of America Club and vice president of the 4H Club at Denham Springs High. She has been competitively showing livestock for the past seven years. Mincey plans to attend LSU in the fall and major in animal science. School administrators have announced a change in the 2018 spring academic calendar to add instruction time that was missed by students because of hazardous weather conditions. The district will eliminate two scheduled half days on Feb. 21 and March 22, and replace them with full days. A student contact day also will be added to the end of the school year – May 25, which was originally a teacher-only day, will now be the last day for students to attend. 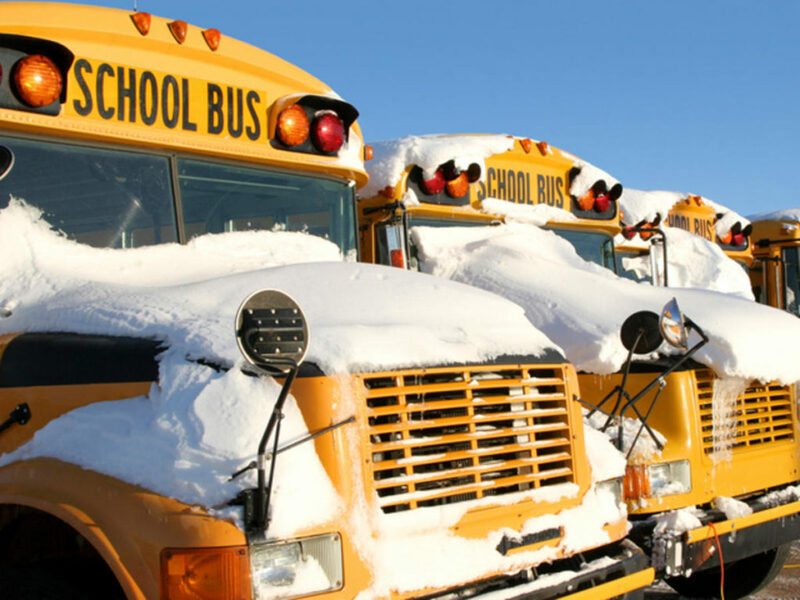 The school system has had to close for five and half days so far this school year because of weather conditions. Two days were missed last fall – one to hurricane-like weather conditions and another to snow. Three and a half days were missed in January due to snow and icing conditions. Livingston Parish Public Schools will receive $703,000 in federal dollars this school year to improve reading and writing for struggling students. The grant is part of a $12 million allocation that is being divided among 56 Louisiana public schools and districts. According to State Superintendent John White, the money will be used to buy popular children’s books and teacher tools to implement a high-quality literacy curriculum aligned with state standards. It will also finance literacy assessments, intervention programs and professional development for educators. Parents and caretakers of students with special needs were introduced to services and programs that benefit their students at the 9th Annual Winter Wonderland, which was held Jan. 11 at the Literacy and Technology Center’s Family Resource Center. A total of 17 booths, which were manned by businesses and agencies that provide services and unique products that can be of assistance to those with special needs, were available to those in attendance. School system teachers, especially those involved with teaching special education students, were also present to meet with parents and inform them about services available for students who need special attention. Jeanne Ebey, project coordinator for the Livingston Parish Public School system’s Special Education Departments, said about 12 percent of the students enrolled in the parish’s schools require special treatment for various reasons. She said the term “special needs” defines a wide array of conditions that some students may possess. For example, gifted and talented students fall under the category of special needs and for these students the school system offers art, theater and music programs. 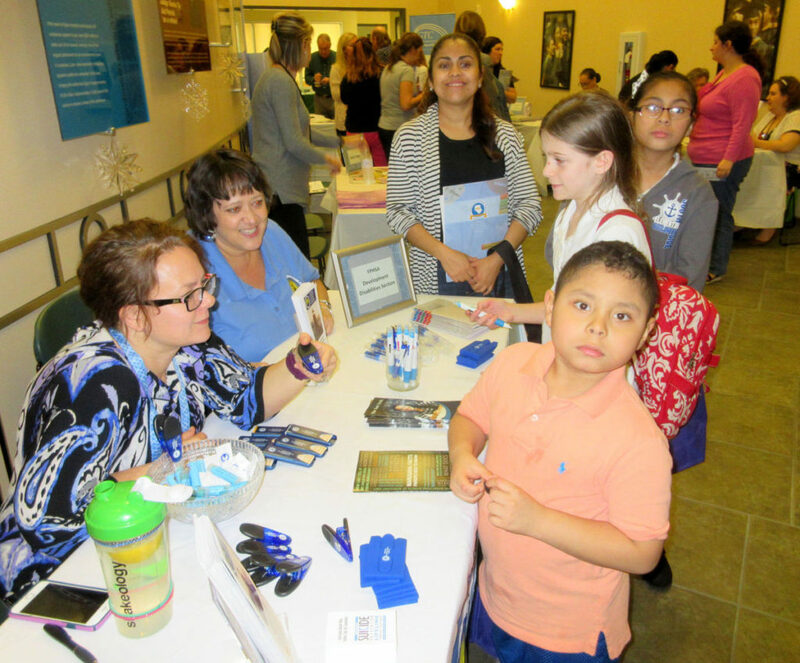 Pictured from the left, Rona Burkett and Jennifer Cass, both of the Florida Parishes Human Services Authority, discuss services offered by their agency with Elsa Torres, Daabelynn Matot, Mone Mutot and Jonathan Mutot at the Winter Wonderland program hosted by Livingston Parish Public Schools at the Literacy and Technology Center. Photo provided by The Advocate. The Livingston Parish Chamber of Commerce recently joined with district officials to host “Connecting to Success,” a student business conference for Maurepas and Albany High School juniors. Some 85 students attended break-out sessions for skill development for sessions and roundtable discussions with local business leaders. The event was geared toward helping students become job-ready and career-focused. Organizers encouraged attendees to pursue advanced training in technical skill areas and/or to attend college. 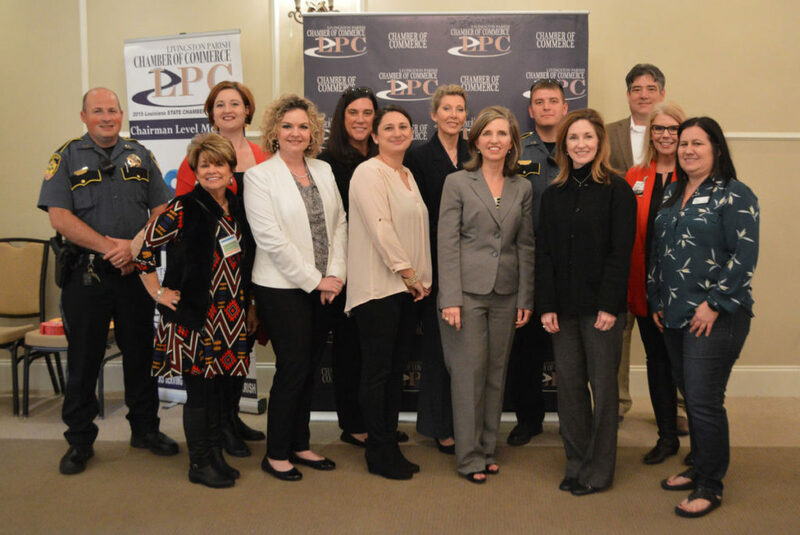 The Chamber of Commerce’s Business and Education Committee recently hosted the “Connecting to Success” event. Organizers included, from left to right, (back row) Brett Savant, Leann Stelly, Margot May, Sherry Mely, Derrick Bozeman, Mike Cotton, (front row) Staci Polozola, Kim Sanders, Amie Barton, Shannon Bernard, Jill Wybel, Regina Scott and Christi Cutrer. Photo provided by Livingston Parish News. 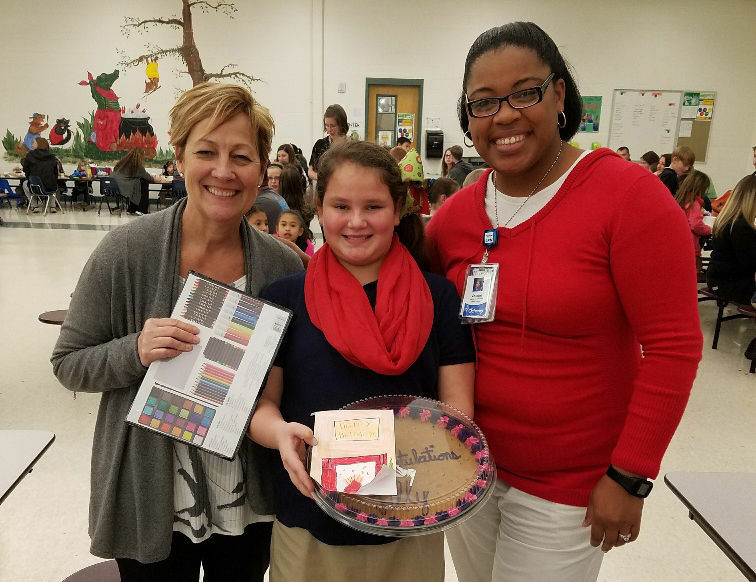 Lily Laxton, center, a fourth grader at Gray’s Creek Elementary, was honored before the holidays as a semifinalist in the Ochsner Healthy Holiday Card Contest. Laxton received a prize of a cookie cake and art kit. She is pictured with Gray’s Creek Elementary Principal Melissa Dougherty, left, and Ochsner Health Center-Denham Springs Manager Val Mouton. Photo Provided by The Advocate. 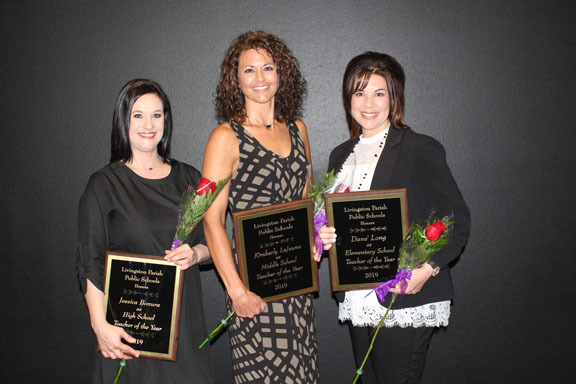 The Livingston Parish Public School System recently announced its top teachers of the year. Superintendent Rick Wentzel, Director of Curriculum Dawn Rush, Title 1 Coordinator Tammy Kuhn and Title 2 Coordinator Debbie Kropog made the rounds to visit the winning teachers, presenting each with a trio of gifts in front of their students. 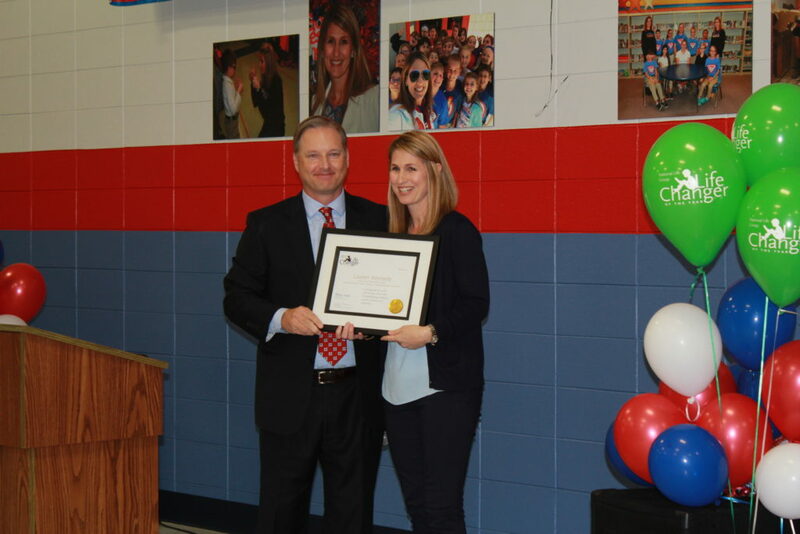 Dané Long, a second grade teacher at Live Oak Elementary, is the parish’s Elementary Teacher of Year. She is a 16-year veteran educator who says her strongest skill is to teach students to read. Long spent her first 12 years as a first grade teacher, and the last four as a second grade teacher – all at Live Oak Elementary. 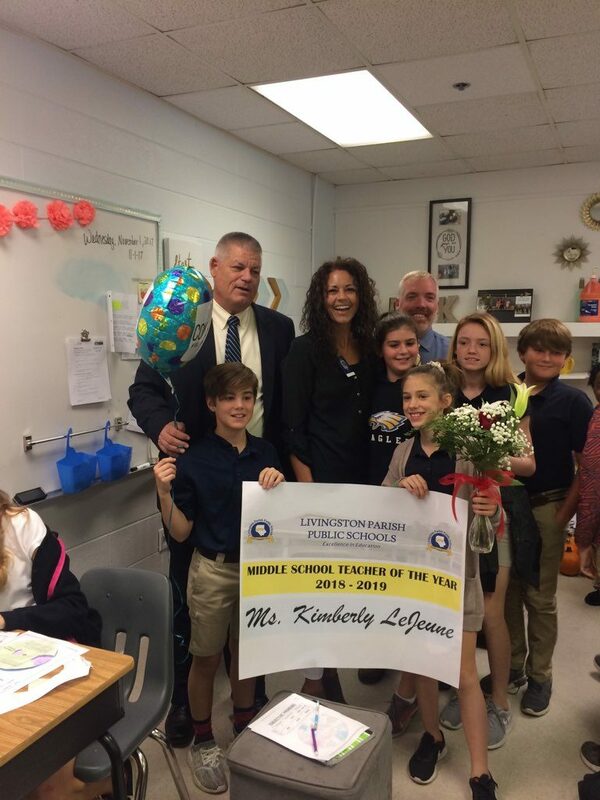 Livingston Parish Middle School Teacher Kimberly Lejeune, pictured back middle, was recognized by Superintendent Rick Wentzel, back left; Live Oak Middle Principal Ryan Hodges, back right; and some of her students. Kimberly Lejeune, an English/language arts and science teacher at Live Oak Middle, is the parish’s Middle School Teacher of the Year. She has 18 years of experience in the classroom, where she emphasizes hands-on learning and finds ways to spark curiosity with her students. She is in her first year teaching ELA and science at Live Oak Middle. She began her career at North Live Oak Elementary. 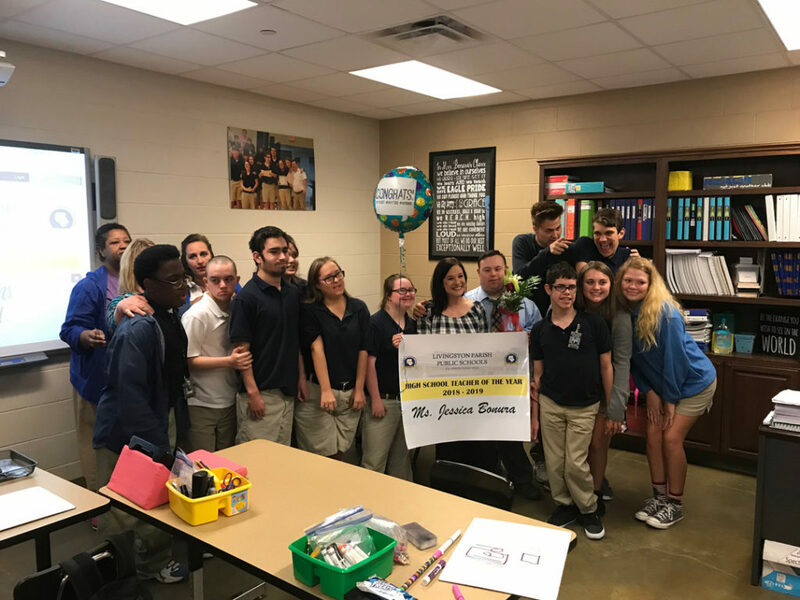 Livingston Parish High School Teacher of the Year Jessica Bonura is recognized with some of her Live Oak High School students and the paraprofessionals who work with them. Jessica Bonura, a significant disabilities/autism (SDA) teacher at Live Oak High School, is the parish’s High School Teacher of the Year. Bonura began her career as an SDA teacher 12 years ago, and has been on a mission to change the “negative stigma” surrounding her students and other like them. Her work stems from a personal experience of having a son born with Downs Syndrome. Each school in the parish submitted a nomination for Teacher of the Years honors. Each nomination included a portfolio detailing the career of the nominee. A selection committee reviewed the applicants and narrowed the selection down to two finalists for each of the grade levels – elementary, middle and high school. Those two finalists in each category were brought in for face-to-face interviews where they were asked questions on an array of topics, including what they believe to be the biggest struggles in education today and how they would explain the Louisiana school system to someone from another state. The three winners are required to submit videos of themselves in their classroom setting as part of the state competitions at the regional and state levels. Live Oak High School and Walker High School recently announced they have received grants from the National Math & Science Initiative (NMSI) to improve student achievement through expanded access to challenging coursework. In particular, the grants help to fund teacher development and student participation and achievement in the Advanced Placement (AP) program. Both NMSI grants are for a three-year period. 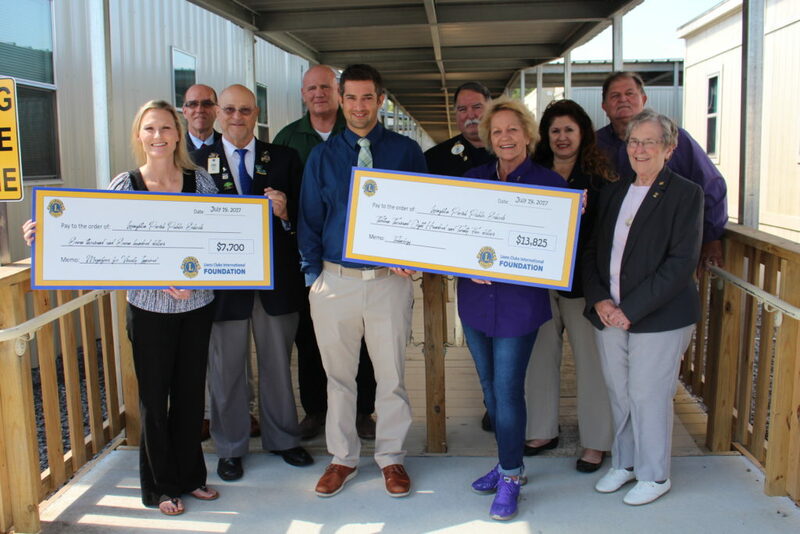 Live Oak High School received $714,909, and Walker High School received $482,902. Through this partnership, the two high schools hope to dramatically increase the number of students taking and earning qualifying scores on AP math, science, computer science, and English exams. Research has shown that students involved in AP math, science and English classes with the NMSI partnership have a dramatic increase in qualifying scores on exams. Research also shows that students with AP scores of 2 or higher have a significantly higher college GPA over students who have not taken AP courses. This is one of the leading indicators of success in college. The grant pays 50 percent of exam fees for AP Math, Science, English and Computer Science classes. Students receive $100 for every 3, 4, or 5 earned in these classes. The grant is providing training for teachers during the summer and throughout the school year through the College Readiness Program. It also provides money for these teachers to use in their classrooms. Live Oak High has students enrolled in 645 AP exams for the 2017-2018 school year. Walker High School offers 12 AP courses and has 178 students scheduled to take 229 AP exams this school year. 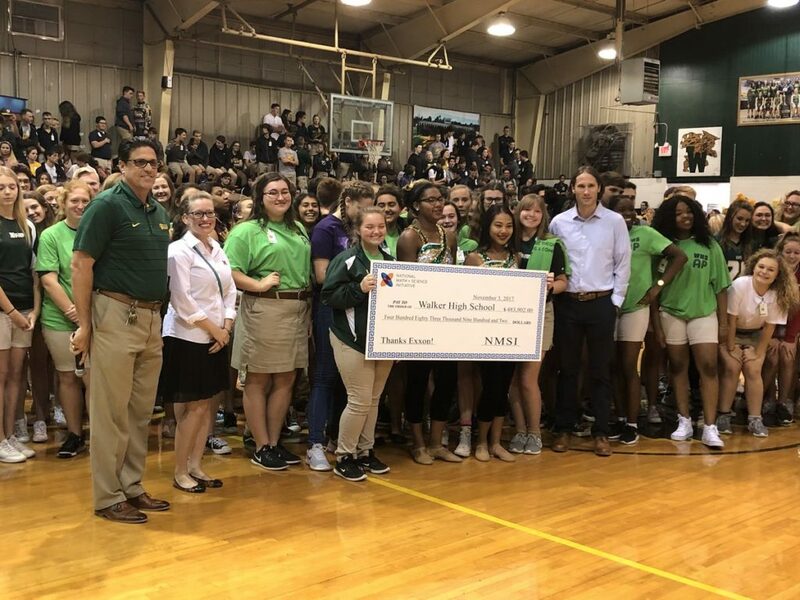 Walker High School Principal Jason St. Pierre, pictured front left, and the school’s Advanced Placement students recently accepted a check from the National Math & Science Initiative to expand access to challenging coursework and improve student achievement. Also pictured are NMSI’s Taylor Bunn, standing next to St. Pierre, and Chad Spurgeon, standing right of the check. Well before the first bell of the school day rings at French Settlement High School or Maurepas School, one can find a small group of students already at work. Some students have laptops in hand, punching out final edits to their written stories, while others are adjusting audio levels on mics or setting up lighting equipment in bright green production rooms. 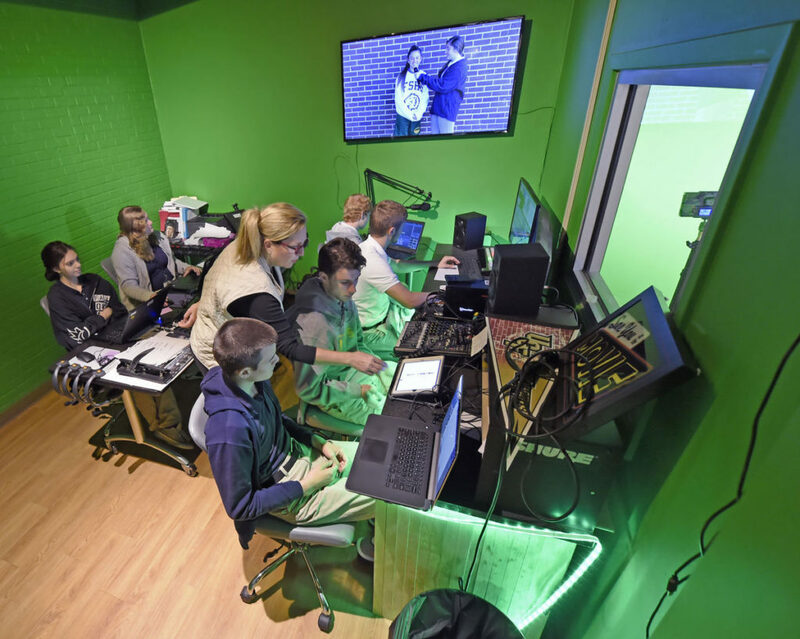 The busy mornings are routine for the digital media classes at these two schools as they do the necessary prep work to broadcast a live daily newscast at each of their schools – “Good Morning, French Settlement!” and “Good Morning, Maurepas!” respectively. Teacher Janet Blankenship works with the students to develop news stories, and to edit copy and piece together bits of recorded video to fill up the newscasts. She began teaching a digital media class at Springfield High, and has now expanded her efforts to Maurepas and French Settlement this year. School Board Member Jim Richardson helped to spearhead the initiative. He invested some of the district’s funds into the equipment and to pay Blankenship’s salary. She shares time between French Settlement and Springfield and oversees the efforts at Maurepas from afar, where two of the school’s teachers help to coordinate broadcasts there. Springfield High does not produce a live daily broadcast. 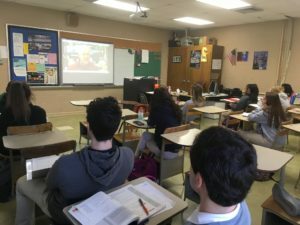 The daily broadcast episodes at French Settlement High and Maurepas School feature student interviews about current events or personal topics, weather reports, state and national news updates, sports news and updates on the school’s lunch menu and activities calendar. Walker High School also offers its students a digital media elective. Currently about 55 students are enrolled in the class on that campus, which teaches them to use video editing equipment, operate broadcast video equipment and produce live broadcasts. 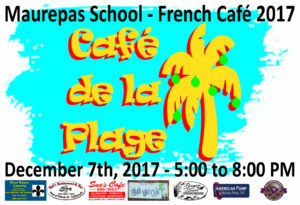 Students and faculty at Maurepas School will host their 13th Annual French Café on Dec. 7 from 5-8 p.m. to raise funds to buy Christmas presents and food for children of less fortunate families in the community. Café patrons will be able enjoy food, entertainment and activities. The evening will include a Silent Auction, where people can bid on artistic pieces and crafts; the “Raffle for a Basket,” where people can purchase raffle tickets to win a huge basket full of goodies; Santa’s Little Workshop; a Cake Walk; an Ornament for a Donation; and a Christmas program. Last year’s event raised more than $8,900, which provided presents to more than 100 children and also provided students with school supplies, uniforms and even graduation fees. The event raised just over $5,000 the year before. 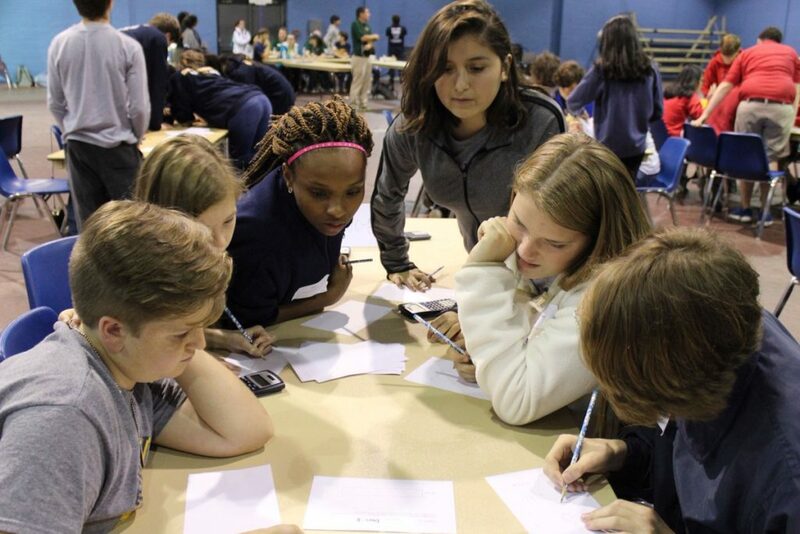 Live Oak Junior High was one of 12 schools that recently competed in the 17th annual mathematics competition sponsored by the Department of Math and Computer Science at the Louisiana School for Math, Science, and the Arts on Nov. 16. The other schools were Natchitoches Magnet School, Caddo Middle Magnet School, Rapides Academy, St. John Berchman’s Cathedral School, D’Arbonne Woods Charter School, Rusheon Middle School, St. Jude School, NSU Middle Lab School, Cope Middle School, Sterlington Middle School, and Grace Christian School. The contest consisted of individual and team competitions. The exercises in each contest came from algebra, geometry and other areas of mathematics, and not from any specific curriculum. The questions were designed to challenge students to draw from their knowledge of mathematics, to think, to synthesize concepts and to solve problems. Members of the Live Oak Junior High math team work on a problem during the team competition at the Louisiana School for Math, Science, and the Arts in Natchitoches. 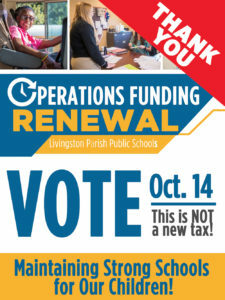 Livingston Parish voters overwhelming approved an Oct. 14 proposition with more than 76 percent approval to renew a 10-year, 7.18 mill property tax to continue funding operational costs of all schools in the parish. The dedicated funding has been on the books since 1979 and makes up one of the district’s largest revenue sources for day-to-day operations. The 7.18 mills are projected to generate more than $3.5 million of the school system’s annual budget. The monies pay for the salaries and worker benefits of essential staff and employees, including school secretaries, bus drivers, custodians and paraprofessionals. These funds also pay for instructional supplies and equipment for classrooms, administrative supply needs, classroom furniture, day-to-day cleaning supplies and general maintenance needs. Voters approved the millage renewal by a vote of 7,360 to 2,306 for an approval rate of 76.14 percent. When the State Department of Education releases its accountability scores this fall for the 2016-2017 school year, Livingston Parish Public Schools will not receive scores or grades because of the amount of days students missed due to the August 2016 flood. The state accountability system includes a provision that automatically exempts districts from the consequences of school accountability measures if they are closed for 18 consecutive days or more due to a natural disaster or unforeseen occurrence. All Livingston Parish Public Schools were closed for 20 consecutive days following the August 2016 flood. The state’s accountability scores for elementary and middle schools are based almost solely on LEAP standardized tests, which are given each spring in the third through the eighth grades. Scores for high schools derive equally from four factors: scores on ACT college placement tests, state-developed End-Of-Course exams, four-year graduation rates and a graduation index where schools get the most points for students who take advanced coursework. Livingston Parish is the only public school district that missed 18 days or more due to the August 2016 flood. East Baton Rouge Parish, which was closed 16 days after the flood, has requested a waiver to exempt some of its schools for this year’s accountability report. 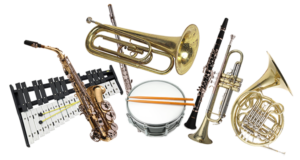 Fourteen Livingston Parish band students in grades 9-12 from Albany, Denham Springs and Walker high schools were chosen as members of the 2017-2018 All-State Band. Those band members selected include: Albany High School’s Katie Miranda, junior, bassoon; Denham Springs High School’s Savannah Cecchini, freshman, flute; Victoria Seeger, junior, clarinet; Bobby Chedville, senior, trumpet; Katie Howard, sophomore, horn; Colby Eisenberg, junior, tuba; and Morgan Lovell, senior, bass clarinet; and Walker High School’s Ethan Archer, senior, clarinet; Peyton Berry, sophomore, clarinet; Kaylee Hibbard, sophomore, trumpet; Aaron Tapalla, freshman, trombone; Logan Yarbrough, junior, euphonium; Christian Noto, junior, tuba; and Brian Harley, senior, percussion. In order to make the cut, the students had to win the judges’ approval at two highly competitive auditions – one at LSU on Sept. 16, and a second at Pineville High School on Oct. 14. Participants were tasked with performing two prepared pieces and a sight reading piece. The top three finishers of the 34th Annual Livingston Parish Fair Spelling Bee were, left to right, John Austin Bergeron of North Corbin Junior High, 1st place; Chloe Poissot of North Corbin Junior High, 2nd place; and Jake White of Holden, 3rd place. 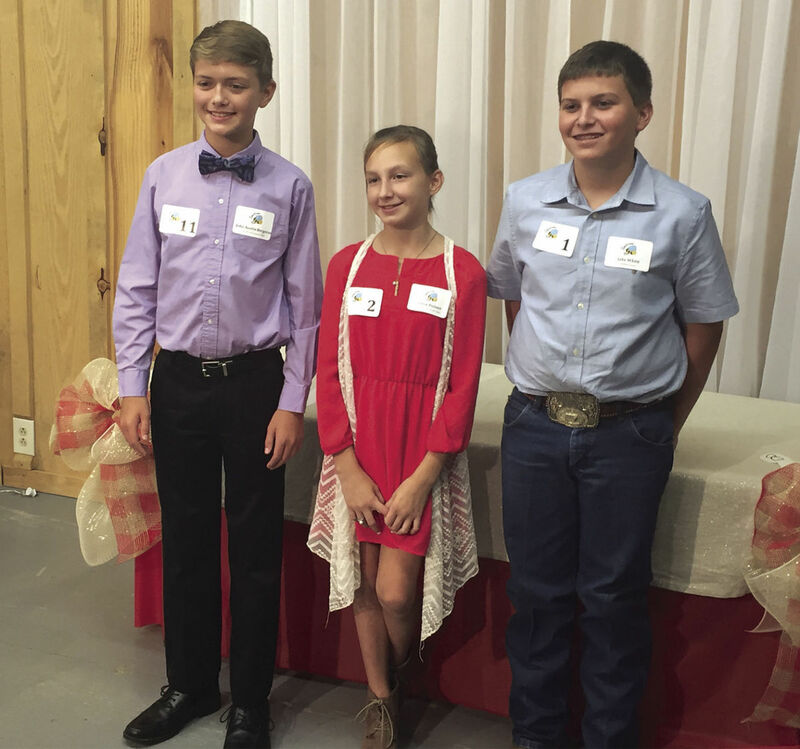 Ten seventh graders from Livingston Parish took the stage inside the Green Barn on Oct. 9 at the 34th Annual Livingston Parish Fair Spelling Bee to compete for the title of the parish’s top speller. The event was sponsored by The Livingston Parish News, with publisher and editor McHugh David calling out the words for the students to spell. North Corbin Junior High’s John Austin Bergeron correctly spelled the words “observatory” and “nursery” to win the contest, edging out his schoolmate Chloe Poissot, also of North Corbin Junior High, and Jake White of Holden, who finished second and third, respectively. Other competitors included Nicholas Parfait and Sydney Henderson of French Settlement; Amira Raddler and Camryn Stewart of Doyle; Chloe Picou and Arlene Herrera of Albany Middle; and Ella Stephens of Holden. Bergeron was awarded $100, a personal trophy and an additional trophy for his school. Poissot was awarded $75 and a trophy for coming in second place, and White received $50 and a trophy for coming in third. Superintendent Rick Wentzel announced that Livingston Parish Schools reported an official enrollment of 24,485 for the 2017-2018 year based on the district’s Oct. 1 count. That number is up drastically from the Oct. 1 count of 2016 when so many students were out due to the flood. The number is only about 500 less than what the district had at the start of last school year. “We’ve got kids still returning to our system. Some families are returning slowly, and the recovery process is still ongoing, but they are coming back. With that said, we also have new kids coming to our parish with the continued residential growth that’s happening in our parish,” Wentzel said. The State Department of Education designates the beginning of October and February as official enrollment days. Those numbers are used to calculate the vast majority of the funding provided to public schools through the state’s Minimum Foundation Program. Andrea Idong, pictured second from the left, has been named the 2017 SADD Student of the Year. In that role, Idong will promote SADD’s mission at the local, parish, and state level. Throughout the school year she will facilitate teen workshops, and design health and safety campaigns for campuses across the parish. She will serve on the organization’s board of directors, and be a voice for the teenagers involved. 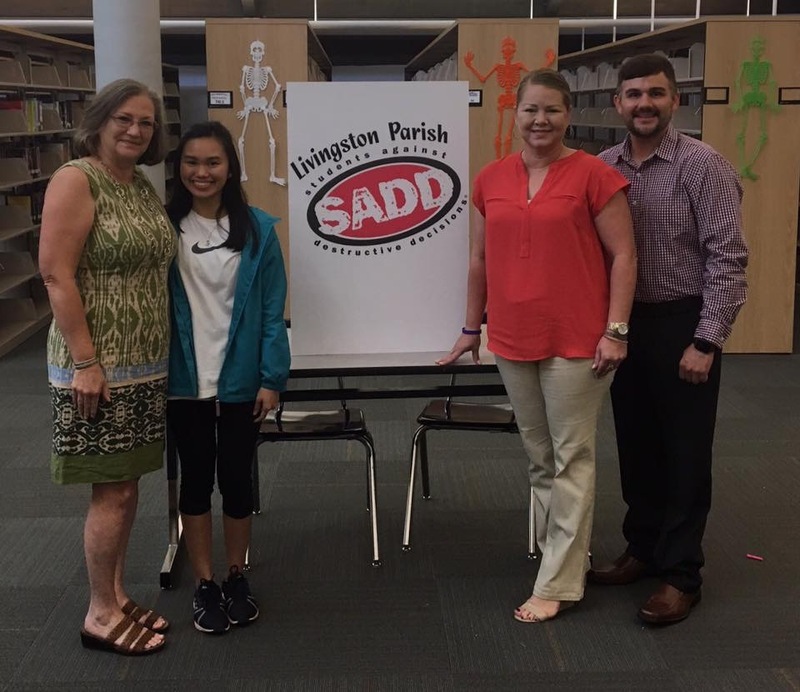 Pictured with Idong, left to right, are Denham Springs High SADD Teacher Sponsors Elise LeBlanc and Shanna White, and Louisiana SADD Director Dylan Ivy. 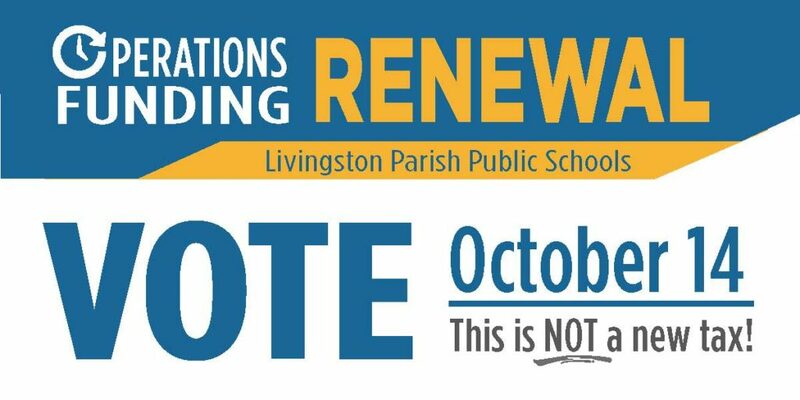 The Livingston Parish School Board is asking voters to renew a 10-year, 7.18 mill property tax that is dedicated to operational costs for every school in the parish. The proposition on the Oct. 14 election ballot is not a new tax, and it will not increase the amount of taxes currently being paid each year by parish property owners. 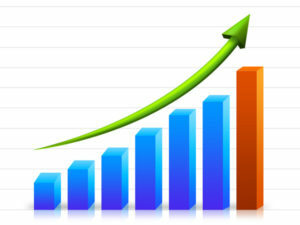 Wentzel noted that the 7.18 mills are projected to generate more than $3.5 million of the school system’s annual budget. These dedicated monies pay for the salaries and worker benefits of essential staff and employees, including school secretaries, bus drivers, custodians and paraprofessionals. These funds also pay for instructional supplies and equipment for classrooms, administrative supply needs, classroom furniture, day-to-day cleaning supplies and general maintenance needs. Election Day is Oct. 14. Early voting is available Sept. 30 to Oct. 7. 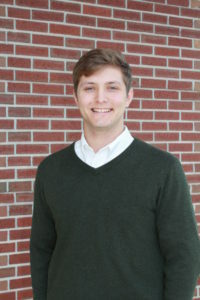 Ethan Brooks, a senior at Live Oak High School, has been named a National Merit Scholarship Semifinalist. The National Merit Scholarship Program recognizes and honors academically talented students across the United States, and it is one of the most prestigious scholarships offered. To enter the competition, a student must take the PSAT test during his or her junior year of high school. From the 1.6 million students who meet entry requirement, approximately 15,000 are selected as finalists. All winners of Merit Scholarship awards are chosen from the finalist group based on their abilities, skills and accomplishments. As a semifinalist, Brooks has the opportunity to continue in the competition and vie for one of 7,500 National Merit Scholarships that will be offered next spring. Brooks has a cumulative GPA of 4.3 on a 4.0 weighted scale. He scored a 34 on the ACT. He is a senior class officer, a member of the school’s BETA Club, Robotics Club, SHARE Club, Future Business Leaders of America, KEY Club, Art Club and Fellowship of Christian Athletes. 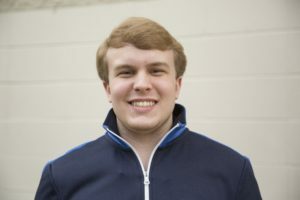 He also served as a school Ambassador, was on the committee to design the school’s Academic Letterman Jacket, and is a member of the Mu Alpha Theta Honor Society. 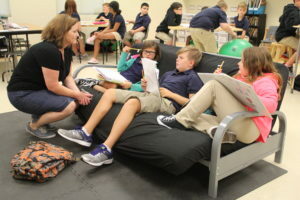 Juban Parc Elementary Teacher Sarah McCrary discusses a class project with fourth-graders, from left, Mackenzie Landry, Christian Ferguson, and Kaia Juban, who are seated on the classroom’s futon. Students at Juban Parc Elementary School are learning from a new perspective this school year – and like the cliché says, it comes from where they are sitting. Or better yet, how they are sitting. Several of their classrooms have been redesigned to incorporate more flexibility in their daily routine. Seating options include bouncy balls, wobbly stools, floor cushions and a futon. Students are allowed to choose the type of seating and area in the classroom that’s most comfortable for them. In some cases, the options help students manage their restlessness, other options are just more comfortable than the traditional desks with hard-backed chairs and they make it easier for them to collaborate with their classmates. “We are changing our classroom culture to give our students the space and room they need to move about and collaborate with others. The options are helping our students focus better on what we’re trying to do in our classes, and that’s boosting learning,” Juban Parc Elementary Principal Shanna Steed said. Studies suggest that children who participate in short bouts of physical activity within the classroom have more on-task behavior, with the best improvement seen in students who are least on-task initially. Southside Junior High Principal Wes Partin drove a bus filled with supplies to Humble, Texas, to help victims of Hurricane Harvey. Photo courtesy of Livingston Parish News. Several schools across the parish recently collected donations for flood victims in the Houston area, after devastation was caused by Hurricane Harvey. The donations helped to purchase cleaning supplies, gift cards and housing goods. 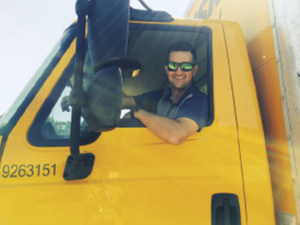 Partin, along with Juban Parc Junior High Assistant Principal Justin Wax and Denham Springs Junior High Principal Bryan Wax, filled a rental truck with more than $10,000 in relief aid and drove to Humble, Texas. He said nearly 6,000 people came out to receive items. After handing out the supplies, Partin said he and the other Livingston Parish administrators helped to tear out damaged material from homes. Livingston Parish Assessor Jeff Taylor, local businesses, and area volunteers once again sponsored the Assess the Need program in Livingston Parish to provide school supplies for more than 2,600 students. This was the 17th year the annual campaign has helped needy families receive school supplies for their students. Most supplies were purchased in bulk and given to school principals and counselors to hand out to students on the campus during the first week of school. 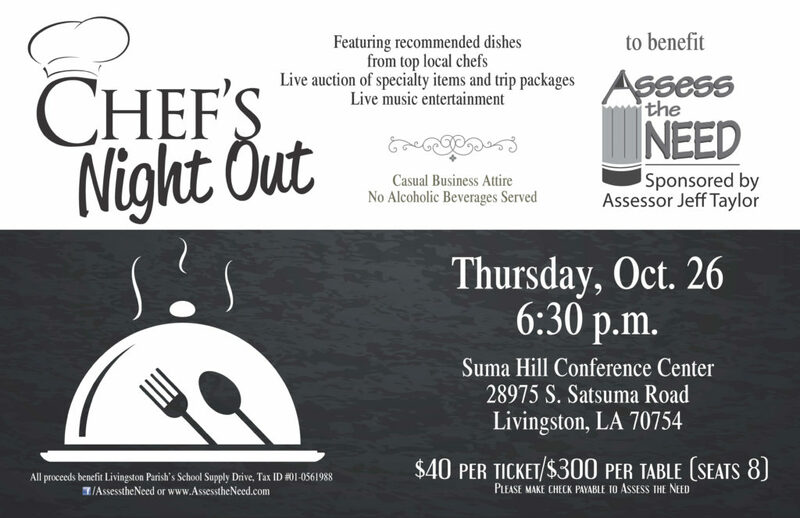 A “Chef’s Night Out” event at Suma Hill Conference Center benefitting Assess the Need will be held Oct. 26 at 6:30 p.m. All proceeds from the event will go to help with supply needs in Livingston Parish Public Schools. Call the Livingston Parish Assessor’s Office at 225-686-7278 for information on how to purchase tickets. 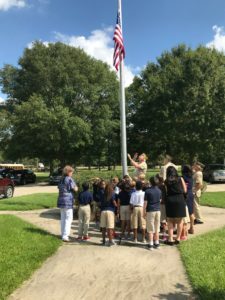 The VFW Memorial Post 7017 recently donated a new American flag and a solar powered light to Lewis Vincent Elementary in honor of veterans in Denham Springs. Post Commander Robert Nolan and members Vance Sutton and Tommy Shaffett made a special presentation to the school. They talked to a second-grade class about the importance and symbolism of the flag, as well as the significance of remembering the nation’s war veterans. Livingston Parish Public Schools is among the state’s Top 10 highest performing school districts for student performance on the 2017 Advanced Placement (AP®) exams, according to the latest data released by the Louisiana Department of Education. More than 38 percent of all students in Livingston Parish who took college-level AP® exams at the end of the 2016-2017 school year earned a score of 3 or better on the exam. Students who earn a score of 3, 4, or 5 are eligible for college credit at all Louisiana higher education institutions. The district’s passage rate of 38.6 percent is up from last year’s 36.9 percent passage rate. The average passage rate statewide for the 2017 exams is 34 percent. Livingston Parish schools had 1,056 students take AP® exams this past year, giving it the greatest level of participation among other top-ranking school districts. Supervisor of Instruction Tracy McRae said the district saw an increase in participation and performance at nearly every parish high school. Live Oak High School led the effort with 475 students taking AP® exams last year, and more than 55.4 percent of them earned a score of 3 or better. Walker High School had a 53.2 percent passage rate from the 156 students who took AP® exams at that school. Assistant Superintendent Stephen Parrill pushes a moving dolly loaded with a new office desk past the window-laden wall of Live Oak Junior High’s newly expanded cafeteria and the newly sodded outdoor commons area. Seventh and eighth grade students in the Live Oak community were welcomed to a new, but somewhat familiar, campus on their first day of school. They became the first students to attend the new Live Oak Junior High at 35086 Old Highway 16 – the site that for many years was the original Live Oak High School. 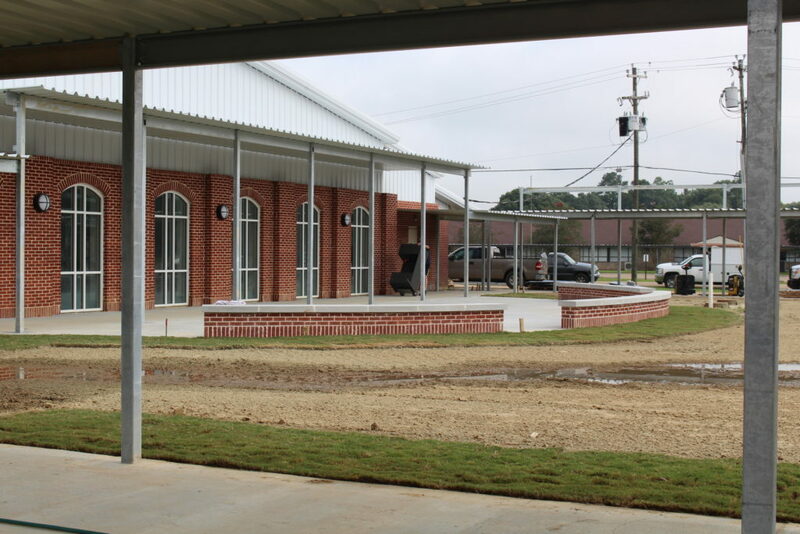 The campus became dormant 2 ½ years ago when the new Live Oak High School campus opened on Highway 16, and all Live Oak students in grades 9-12 were transferred to the new site. Wentzel noted that the main campus of the new Live Oak Junior High did not flood in August 2016, so all improvement to the campus were part of the original plans. Changes include a new brick façade and archways, wrought iron fencing and beautified common spaces. The school also has an expanded cafeteria and band room, new library, updated classrooms with better lighting, air conditioning, and greater capacity for wireless access, as well as clean, well-lit hallways and fully-retrofitted gymnasiums that can function as community shelters in the event of an emergency or natural disaster. The opening of Live Oak Junior High created some grade restructuring at the other campuses in the Watson school district. Live Oak students going into 5th grade this school year joined 6th grade students at Live Oak Middle School, while the three elementary campuses – Live Oak Elementary, North Live Oak Elementary and South Live Oak Elementary – are only housing students in grades Pre-K to 4th grade. Pictured from left to right are Louisiana Community & Technical College System President Monty Sullivan, Northshore Technical Community College Chancellor William S. Wainwright, State Rep. J. Rogers Pope, and Gov. John Bel Edwards. A new 20,000-square-foot building that will be the Northshore Technical Community College Advanced Technology Center is coming to Livingston Parish. Gov. 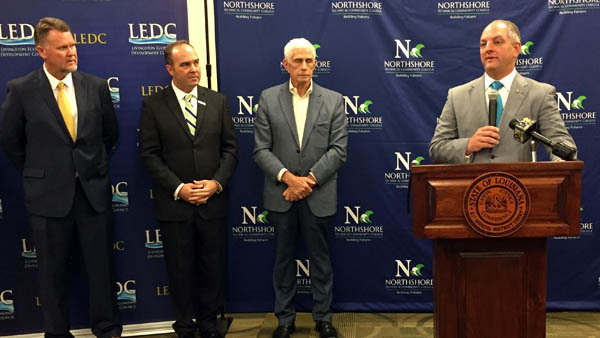 John Bel Edwards and local legislators made the announcement on Aug. 9. They noted that the new campus will support existing high school duel enrollment programs, customize training programs supportive of business and industry, and transfer programs in partnership with Southeastern Louisiana University. The new campus will be built next to the existing Literacy and Technology Center on Highway 190 in Walker on land donated by the Livingston Parish School Board. “We know that the demand for well-trained and skilled workers will expand as business opportunities in Livingston Parish expand, which is why this new facility is going to be integral to the future economic development of this area,” Gov. Edwards said. The Lions Club International Foundation recently presented Livingston Parish Public Schools with $7,799 to purchase magnifying technology to assist students with visual impairments in the district, and $13,825 for portable laptop computers for students at Southside Junior High. Pictured, left to right, are (front) Livingston Parish Public Schools Speech Language Pathologist and Assistive Technologist Jessica Gill, Lions International District 8-N Grant Administrator Bill Heyerdale, Southside Junior High Principal Wes Partin, Lions’ Nancey Farr and Judy Dudley, (back row) Lions’ Scott Dudley, Livingston Parish Public Schools Assistant Superintendent Steve Parrill, Lions International District 8-N Governor Melvin Abbott, and Lions’ Helen Lemoine, and Ivan Duhe. 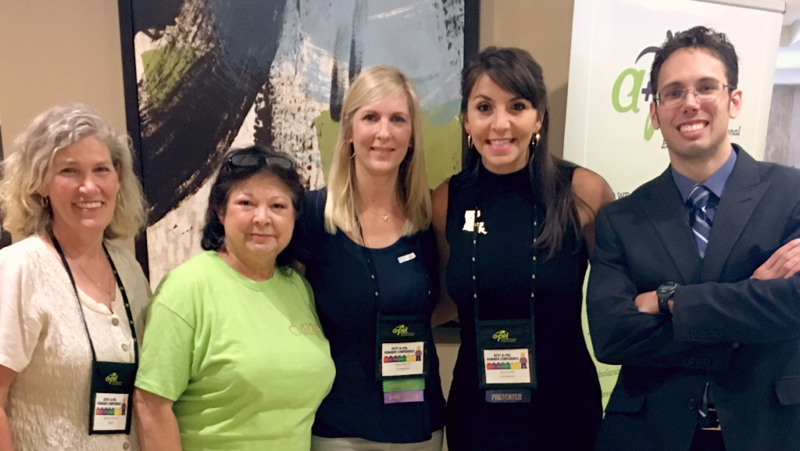 Livingston Parish teachers joined other educators from across the state at the Annual Associated Professional Educators of Louisiana (APEL) Leadership Training Conference held in Baton Rouge. Teachers focused on professional development, teacher advocacy, organizational skills, and strategies for improving classroom instruction. 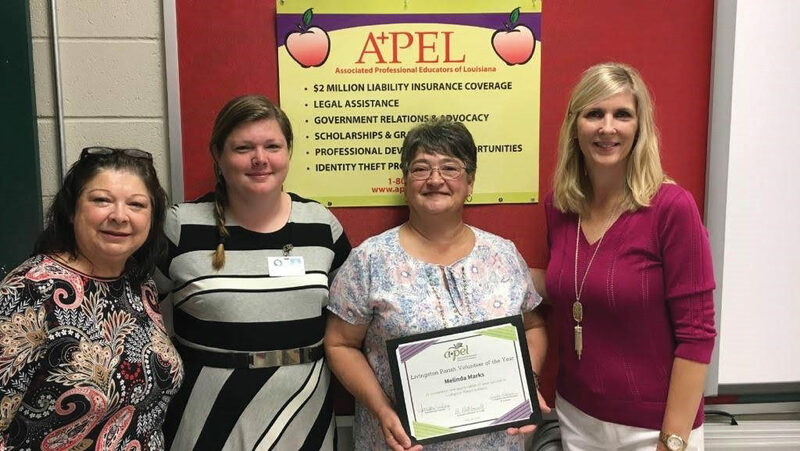 Pictured left to right are APEL Staff Member Jeanie Achord, Livingston Parish APEL Chapter Office Mary Carlin, Livingston Parish APEL Chapter President Julie Norris, 2016-17 Louisiana State Teacher of the Year and Albany Middle School Teacher Joni Smith, and APEL CEO Keith Courville. The Livingston Parish School Board recently approved a plan to purchase flood insurance for all buildings in the school system, including those required to have coverage by the Federal Emergency Management Agency (FEMA) and those not required by FEMA to have it. The district’s total annual premium for all buildings is $925,127. This amount is more than $150,000 less than what was originally quoted to the school board because a preferred rate was made available by the insurance provider for some of the zones in the district. The millage renewal is not a new tax, and it will not increase the amount of taxes currently being paid each year by parish property owners. Parish voters have supported this dedicated funding source since 1979 to pay for salaries of essential staff and employees, instructional supplies and equipment for classrooms, administrative supplies and expenses, as well as day-to-day cleaning and maintenance needs. The election will be held on Oct. 14. Early voting is Sept. 30 to Oct. 7. The mission of the Livingston Parish Public School System, in partnership with home and community, is to provide all students with exceptional education opportunities that will equip life-long learners with the skills necessary to become responsible citizens in a global society. District 5 – Buddy Mincey, Jr.
April 18 – School Board Meeting, 7 p.m.
May 2 – School Board Meeting, 7 p.m.
May 16 – School Board Meeting, 7 p.m.
June 6 – School Board Meeting, 7 p.m.
June 20 – School Board Meeting, 7 p.m.